Gastroesophageal reflux is the term for what happens when part of the stomach’s contents – especially highly acidic gastric juices - travel back up the oesophagus. This disorder causes what is referred to as heartburn (though it is actually oesophagus burn). If it persists over the long-term, the consequences can be more serious: since the oesophagus wall is unable to withstand the acidity, it results in chronic inflammation with the potential for more serious damage (particularly ulcers). What could be masked by the symptoms? The symptoms of gastric acidity may seem harmless but they can sometimes mask or lead to a gastric ulcer. It is therefore very important to treat reflux as soon as it develops. Heartburn can cause other symptoms such as a chronic cough, a husky voice, digestive problems, inflammation with lesions (ulcers or wounds), narrowing of the oesophagus (peptic stenosis), problems swallowing, laryngospasm and even cancer of the oesophagus. Why is reflux so difficult to treat? Gastroesophageal reflux is a common and persistent problem which often proves resistant to conventional medicine. Most of the time, treatment involves the use of substances ranging from simple antacids (such as chewable calcium carbonate or bicarbonate tablets) to more active medications such as Maalox® or Gaviscon®, as well as proton pump inhibitors (PPIs) which directly counteract the production of acid by the stomach. Another option is H2 antihistamines which by blocking certain receptors in the stomach, reduce acid secretion and thus regurgitation. These remedies are very widely used but they all involve adverse side-effects, and in particular, increase the risk of osteoporosis-induced fractures. What are the possible causes of acid reflux? Unfortunately, in most reflux sufferers, there is a fault in the muscle that lies between the oesophagus and the stomach, called the lower oesophageal sphincter. This muscle is only supposed to open to allow consumed food to pass through, but in the case of reflux, it opens at inappropriate times and allows gastric juices to flow back towards the oesophagus. Why look to nutritional supplements to treat acid reflux? Easy to absorb, effective and inexpensive, these are used as standard therapy for neutralising excess acidity. Commercially-available antacids often contain calcium carbonate and it is often thought that it is the calcium which provides the antacid effect, whereas in actual fact, it is the carbonates which have alkalinising properties that combat gastric hyperacidity. It’s no coincidence that liquorice is traditionally used to treat digestive problems. Studies show that it stimulates production of mucous by the stomach and boosts its natural protection against digestive secretions and certain drugs - provided it is free of glycyrrhizic acid (a compound that can raise blood pressure). This is indeed the case with the extract in Anti-Acid Reflux Formula and in DGL, a supplement designed to relieve dyspepsia. Other research has shown that deglycyrrhizinated liquorice (DGL) prevents Helicobacter pylori bacteria, the principal cause of peptic ulcers, from adhering to the stomach wall, an effect similar to that of Pylori Fight. Another study of around 100 subjects showed that DGL also has an anti-ulcer effect comparable to that of Tagamet ®, a type 2 antihistamine. Lastly, it is also known to stimulate growth of gastric and intestinal mucosa cells, while increasing blood flow and reducing muscle spasms. This is a bioavailable and highly active form of magnesium which helps prevent oesophageal and stomach muscles from contracting. This equal parts combination of zinc and carnosine works synergistically. The zinc helps modify secretion of cytokines and combats intestinal inflammation and impairment of the stomach’s immune defences. For its part, the L-Carnosine maximises zinc’s activity at the site of inflammation and in particular, enables it to adhere to gastric mucosa cells. It is also found in the supplement Zinc L-carnosine 37.5 mg. Currently the subject of extensive research, D-limonene is a monoterpene compound found abundantly in the peel of citrus fruits (oranges, mandarins, lemons …). Apart from its fruity fragrance, it is recognised for its anti-inflammatory, antiseptic and muscle-relaxant properties, while the latest research shows it is able to induce apoptosis and thus has an anti-tumour effect. It also stimulates gastric motility and protects against ulcers. Long-used by Native Americans to treat irritation and inflammation of the digestive tract, this plant was subsequently adopted by European colonialists. Today, its bark is known to contain a large amount of mucilage which primarily accounts for its therapeutic virtues. Why choose Anti-Acid Reflux Formula? they complement each other synergistically, and so constitute an optimal reflux remedy. It’s thought that between 20% and 30% of Western populations may be affected by acid reflux and most of them ignore their condition. Yet in the long term, this decision may prove very costly to their health! 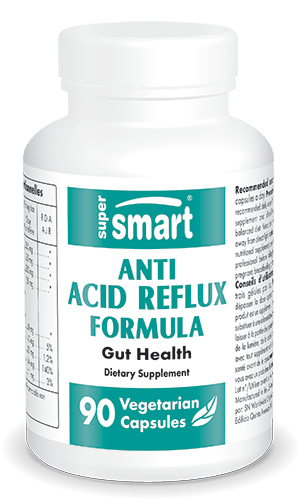 Taking Anti-Acid Reflux Formula will not only improve day-to-day symptoms (at least in terms of heartburn and cough) but it will also prevent the development of ulcers, cancer and chronic inflammation. Where reflux is more resistant, it may be advisable to combine it with digestive enzymes that are free from protease (which irritates the stomach), as well as with probiotics that contain at least 5 billion active organisms (especially Lactobacillus acidofilus bifidus) or a curcuma supplement such as Super Curcuma.